Caption - The Rib valley from the Greenwich Meridian or thereabouts. 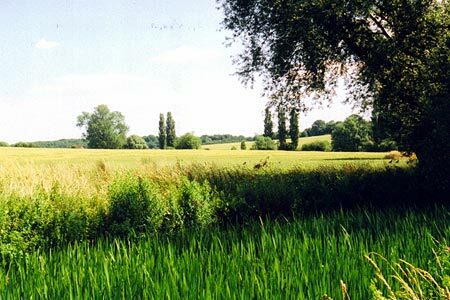 Despite its proximity to London, Hertfordshire offers a wide range of walking opportunities through pleasant countryside and attractive villages. Hemel Hempstead, Stevenage, Watford and St Albans are the main towns with walks to suit all abilities within easy reach. The highest land in the county lies to the north-west at Pavis Wood near Tring (244 metres above sea level). Part of the county lies within the Chilterns AONB and is characterised by rolling hills offering scenic walks. Long distance footpaths in the county include the Ridgeway, Icknield Way, Harcamlow Way, Hertfordshire Way and the Grand Union Canal Walk.